Download our 2019 BAFTA Ballot PDF here! Or as images by clicking on the thumbnails! With the Golden Globes a few weeks ago and the Oscar nominations coming this week, we can gear up to one of my favourite awards, the EE British Academy Film Awards, otherwise known as the BAFTAs, on Sunday February 10th, presented this year by the absolutely fabulous Joanna Lumley. Join in with your friends and family using our 2019 BAFTAs Ballot you can print out and fill in! I’ve only seen a few of these nominees so far, and so my predictions will be based more on what I’ve heard than on the very little I’ve seen (which may increase a bit in the next few weeks). Have a go yourself and please comment below what your predictions are. I will be using my normal scoring system, 1. to indicate my first choice of what I think will win, 2. to show what I think could beat my first choice, and usually, I put a P. for my personal choice of what I think should win. This can later be scored as 2pts for a correct first choice win and 1pt for a correct 2nd choice, no points are given for personal preferences winning as that’s more out of interest and self-expression but really you can use whatever scoring system you like! 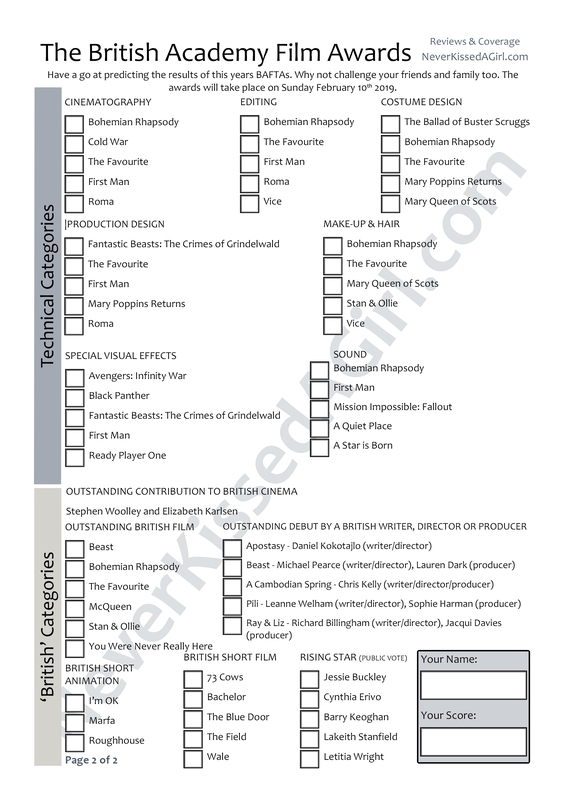 Again the PDF download is here for the 2019 BAFTAs Ballot and I’ll do a post in a few weeks with my predictions of who’s going to win!